Credit Bubble Stocks: Demographics - Don't Buy an Airplane! Demographics - Don't Buy an Airplane! 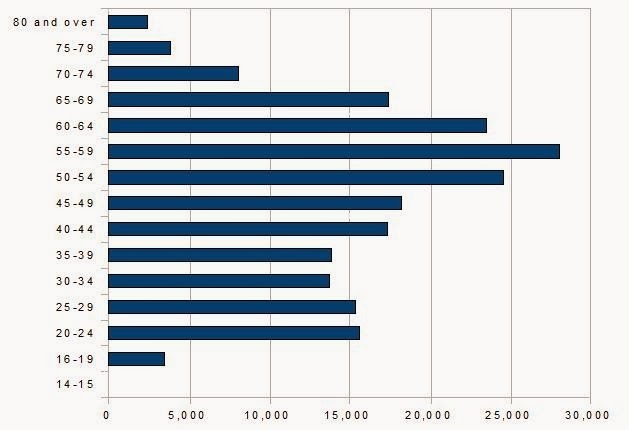 Take a look at the FAA's US Civil Airmen Statistics for 2012, especially the Estimated Active Pilot Certificates Held by Category and Age Group of Holder. Here's a bar chart of the age distribution of private pilot certificates. Uh oh - it's an aging population. There are baby boomer and older private pilots, but not as many younger pilots. There are 11% more private pilots 50 and up as there are 49 and below. You could argue that being a private pilot is just something that 55-59 year olds do because they have time and money - until you compare the statistics for 1999. 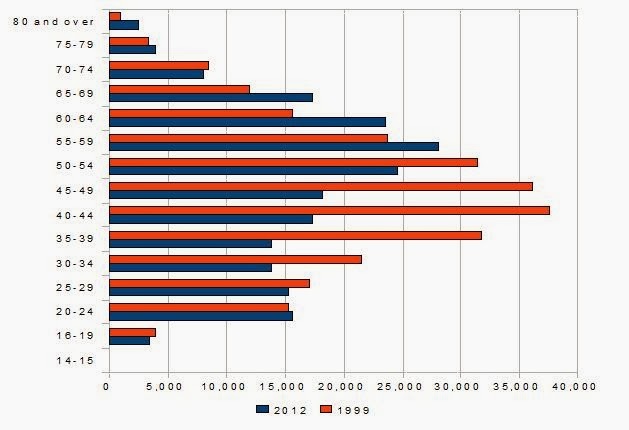 Red is 1999 and blue is 2012. One thing you notice immediately is that the number of private pilots has declined 20% over that time period - a 1.8% annual decline rate. And that's despite 12% population growth over the same time period. I hope Textron isn't "banking" on immigration to help out its Cessna subsidiary! Now there are fewer, older pilots. And the baby boomer, 55-70 year old pilots who own planes, hangars, and so forth aren't going to have enough buyers to sell to. It's the same mistake they made with their lives, and all their assets and investments, here in very stark relief! It should be a buyer's market for used aircraft - and a very difficult new sales market - for a long time to come. If you are selling Cessnas, consider selling long term care insurance or group home memberships instead. Today at age 55 in 2014, being a pilot seems to scary to me. But is it my age or the year?